Why would you use SEO on Pinterest? Isn’t it a social media platform? Yes and no. Pinterest is both – a search engine and a social media site. You have a feed to scroll down when you just want to browse on Pinterest, like on Facebook or Instagram. You can follow users, like on other social networks. But you also have a powerful search tool on Pinterest. Try to search for anything on Facebook – how relevant and useful the results will be? On Pinterest, you find pin images which lead to websites and blogs, and oh, hard to believe, but the results are as relevant as on Google! If you know anything about SEO (search engine optimization) on Google, you are probably prepared for a struggle for months if not years, to get some results from your free traffic generating efforts. SEO isn’t easy on Google, especially if your website is totally new, doesn’t have domain authority. In the first six months or even a year, you are destined to work hard creating high-quality long posts to compete for low-volume keywords. You can’t afford anything competitive because your site is so new, and if you are lucky to get some traffic with long-tail keywords, your traffic volume is low simply because the keywords you targeted, are low-volume keywords. For someone who wants to see any income from a new site or blog, this reality is depressing. But don’t worry, SEO on Pinterest is not that complicated (yet) and you have a perfect opportunity to leverage the free traffic before the platforms become too crowded with smart online marketers. For me, Pinterest was the last hope as I started my blog in 2017 when Google was already extremely competitive, Facebook cut off free impressions for pages and businesses forcing everyone to pay for ads, and to pay more. Instagram… well, Instagram is just a platform with a completely isolated eco-system aiming to prevent users from leaving their app. I invested all my efforts to learn and understand Pinterest SEO and overall algorithm – and it clicked. I am driving 70,000-250,000/mo pageviews to my blog from Pinterest. You may be wondering why such a wide window? Pinterest traffic has big fluctuations, it depends on the season a lot, as well as on having a few viral pins. Viral pins can skyrocket your traffic from Pinterest for a couple of months and when the viral effect fades away, you are getting back to some average numbers. How do I use SEO on Pinterest? I can tell you that SEO on Pinterest is not as complicated and competitive as on Google for various reasons. There is less competition because so many users have no idea how Pinterest works, and simply pin and repin their content without giving a second thought about the keywords they use (if any keywords or descriptions are added at all). Pinterest SEO [as of 2019] is also more straightforward than Google SEO because the algorithm is not as sophisticated. 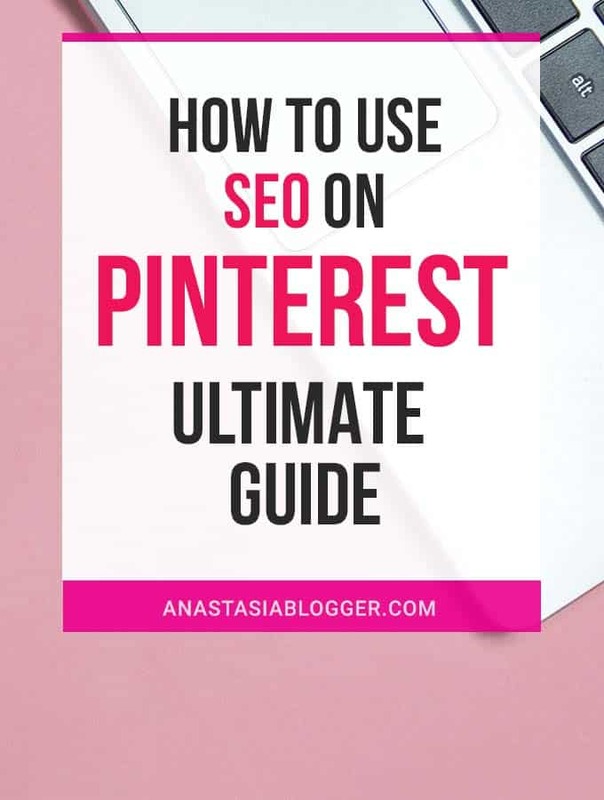 I’ll talk more about the algorithm later, for now, what you need to know is that there is nothing a beginner blogger could find difficult to understand or implement about Pinterest SEO. I will not elaborate much about what you need to do to create a business account or make a migration from a personal account, and how you verify your site and enable rich pins. I wrote a detailed Guide about the Pinterest Rich Pins here. Don’t miss this step because Pinterest representatives made it clear that using a personal account to promote a website is against their ToS, so you can easily get your account permanently banned for doing this. Also, Pinterest speakers also said that when you use a business account and claim your website, for the platform it means your pins deserve a priority and better distribution. 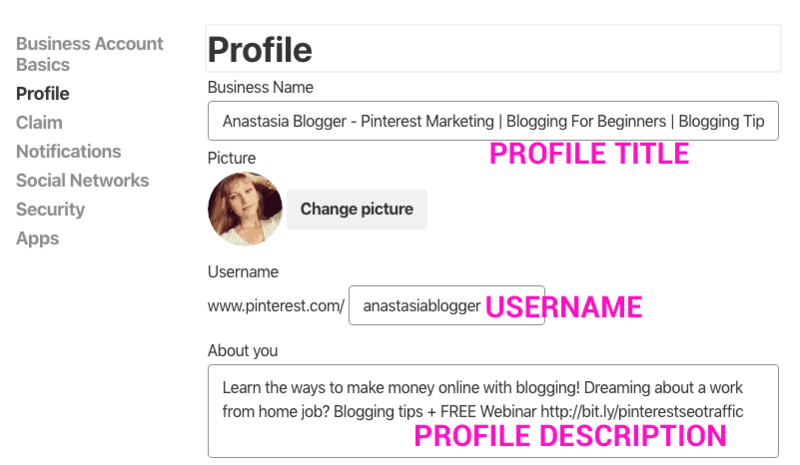 Your profile shows up when users search for “People” on Pinterest, and the choice of keywords used in your Profile name and description will give signals to Pinterest. If you migrated from a personal account and your business name doesn’t sound good with a username “Martha Smith” for example, you can change the username to anything that is still available on Pinterest and fits your business better. Sometimes people worry that changing the username they will hurt their old pins or boards. But don’t worry, really. I’ve done this with several of my accounts and nothing will be broken. As for the pin URLs, they don’t include your username anyway so they will remain the same. 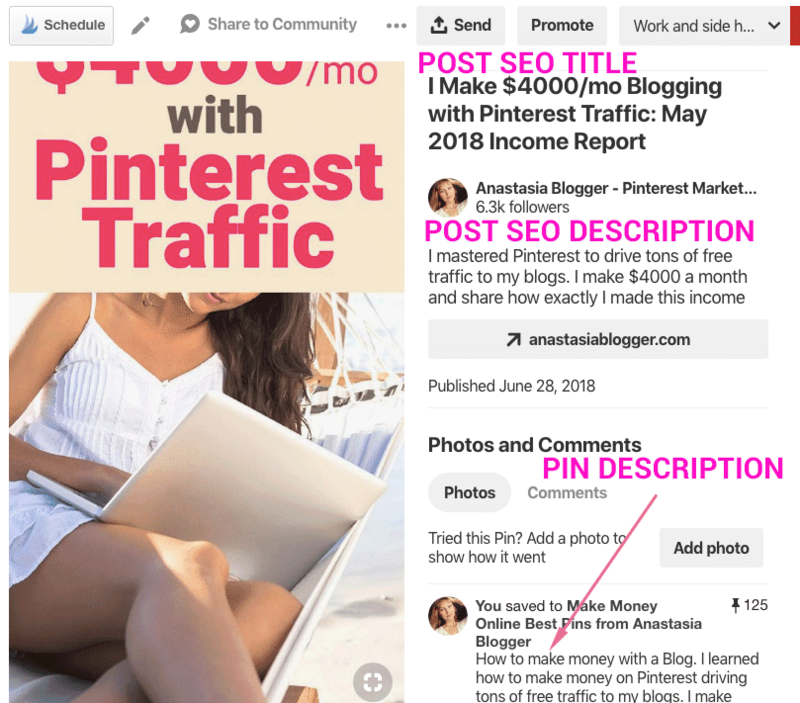 As for the board URLs, they will change but Pinterest makes an automatic redirection and I don’t think that anything will be truly affected, in terms of SEO. If I change the username from anastasiablogger to anything else, the username part of the URL will change immediately and automatically. I noticed that my old board URLs were available for a while after the switch, along with the new URLs, but that could be just browser cache or whatever. When Pinterest completes the switch, your old URLs will be automatically redirected to the new ones. Pinterest also has search functionality that allows users to search for boards. A board with strong keywords in the title and description will rank high in Pinterest search results but also this will help all the pins which you save to the board, to get the right keyword context from the starting point. When you have a brand-new pin image, Pinterest needs to understand what that pins is about, to understand for which keywords it should rank high. So, make sure to always have your boards SEO optimized for keywords that you targeting in each board, and when you save a new pin to an optimized relevant board, this helps your new pin to take off on Pinterest faster and gain early engagement. If you’ve seen on Pinterest boards with titles written in weird ways, like “B E S T R E C I P E S” (probably to attract more attention) with extra spaces between characters. Or if you’ve seen board fancy board titles like “My Yummy Favorites”, in both of these examples the SEO purpose of the board title is completely ignored. These titles are not only useless, but they might also actually be hurtful for the SEO potential of the pins which end up on these boards. Pin Description you added while saving the pin. You will be surprised to know that pin descriptions are most of the times invisible for users (Pinterest is saving space in the feed to show more pins, I guess). But it doesn’t mean that you can ignore pin descriptions. They are very important for SEO of your pins! Pinterest is changing their mind about hashtags quite often. They were allowed for a few years then completely banned as a spammy practice for a few more years. In 2017, out of nowhere, Pinterest announced hashtags are allowed but recommended to limit the number to 20 hashtags max per pin. Also, Pinterest insists that unlike other platforms where adding any popular hashtags to your image is ok, you have to add only relevant hashtags on Pinterest. They may define your niche very wide (for example, if you made a Vegan dessert, it’s ok to use the wider hashtags #vegan and #desserts along with #vegandessets). How Can You Make Keyword Research on Pinterest? I answered this question fully in a detailed post: Looking For A Pinterest Keyword Tool? You will find out from that post, how to check Pinterest search volume. I even shared my hack which allows you to see the approximate keyword search volume using a free Pinterest SEO tool right on their platform, check it out here! Before we move on, I want you to understand that even being a Pinterest expert, I can’t know for sure and in all details how Pinterest algorithm 2018 works. All I can tell you is based on my experience and the information Pinterest representatives shared publicly. Keep in mind that Pinterest will never share all the details as this would open the door for spammers and all kinds of manipulations on the platform at a large scale. When we talk about Pinterest algorithm, we first need to look at the four different interfaces. Which one shows pins based on its own algorithm. Let’s take a look at each of these places as opportunities and try to understand how they work. Smart feed (also called Home feed) is the default view of your Pinterest account. You could compare it with Facebook’s feed because what is shown is based on a combination of your interests, people and boards you follow, pins you saved earlier, your search history on Pinterest, etc. By taking all these factors into consideration, Pinterest is trying to guess which content you will enjoy the most and for which pins you will come back to the platform again and again. In 2018, Smart feed doesn’t show “fresh” pins first. Pins are currently prioritized as “best first” – and best are different for each user, like I said, depending on user’s behavior on the platform. This tab was introduced in March 2018 and it shows you only the pins from people your follow on Pinterest. In the Following tab, the pins are shown based on their recency, the newest pins are at the top of your feed. Pinterest’s keyword search results are not the same for all users, they are personalized and change based on the which boards and people you follow. Also, search results on Pinterest change with new updates. Pinterest doesn’t announce nor talks about these updates and their frequency in public. But if you spend a few years actively working as a Pinterest marketer, like I did, you will notice that Pinterest’s search results change a lot, usually at the start of each season because Pinterest seems to be rolling updates at least once in 3 months. 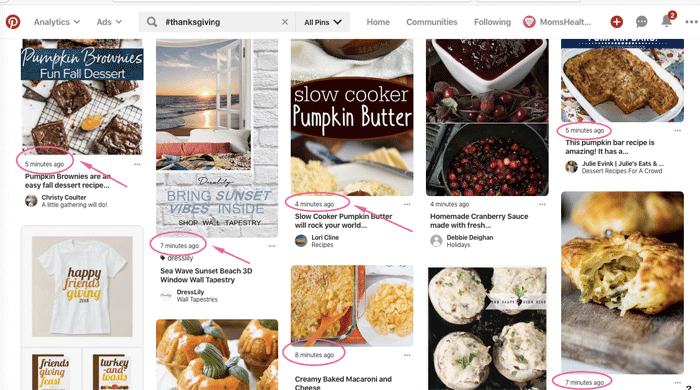 By the way, if you’d like to get an idea of what the latest Pinterest update 2018 has changed and read about the biggest and most noticeable Pinterest updates in 2018, I am collecting them in this post. Pinterest takes seasons very seriously and you probably noticed that the platform is designed to emphasize some seasonal or trending topics in many ways. Updating search results before each season starts seems to be a regular practice. Even if the keywords your targeting are not seasonal at all, since Pinterest updates search results in about every 3 months, all types of keywords are affected. Pinterest seems to have a love-hate relationship with hashtags. In the early years they were ok on Pinterest, then for a few years using hashtags could get your account into a trouble on Pinterest, they were considered spammy. Pinterest is trying to be a search engine but people were bringing hashtags in the way they are used on Instagram. Remember those times when using just any popular hashtags no matter how relevant they are to your image, was popular on Instagram? I believe, nowadays people get smarter and try to use less competitive hashtags even on Instagram, but it took years before people realized that. Pinterest didn’t and still doesn’t want irrelevant hashtags attached to your pins just because they are popular. Keep in mind this strategy can still get you into a trouble on Pinterest. Anyway, in 2017, hashtags were invited back to the platform, Pinterest warned users that 20 hashtags per pin is the reasonable recommended maximum. When they were rolled out, hashtag search results were not based on relevance or user’s interests – they were shown solely based on their freshness. Also, hashtags are shown only for the new pins (so if you repin some pin on Pinterest with a hashtag, it will not show up in the hashtag search). It’s still true for the most part, but I noticed that pins are not always exactly ranked in chronological order. Pinterest seems to start adding other factors to hashtag search results. I suppose they might be showing higher pins from users you are following. – engagement scores on your account (if you have a huge following gained in early years on Pinterest, chances are 30% of your users are either bots that were actively following you back in 2012, or even real people that left the platform and forgot their password from Pinterest forever). This will lead to lower engagement score (repins, click-throughs, comments, “tried it” photos) compared to your following base. I go deeper into this topic in my Pinterest SEO Traffic Secrets course, if you are serious about getting free traffic from this platform, it’s currently the most comprehensive course on the market that teaches you specifically SEO on Pinterest. Here is my post with some fundamental recommendations in regards to the design of pin images that will work for you as traffic generators on Pinterest. Images that are not designed with these tips in mind, will have a hard time ranking on Pinterest, no matter how much work you do on the SEO part for each pin. If you use low-quality, pixelated, horizontal images as pins, most probably they will never get enough user engagement and Pinterest will not show them high in search results. Does Pinterest Help SEO on Google? How to use Pinterest for SEO on Google? That’s a great question and the answer is… it depends on Google. You see, Google is still a giant compared to Pinterest and Pinterest results compete on Google, just like any other website. pinterest.com/explore/diy (the page will not open because Pinterest eliminated Explore pages in 2018). These used to be pages of Pinterest’s Explore tab which was serving two purposes: for users, it used to show some trending and popular pins in each topic or niche. For Google robots, these pages used to be collections of pins with relevant descriptions, tons of them. 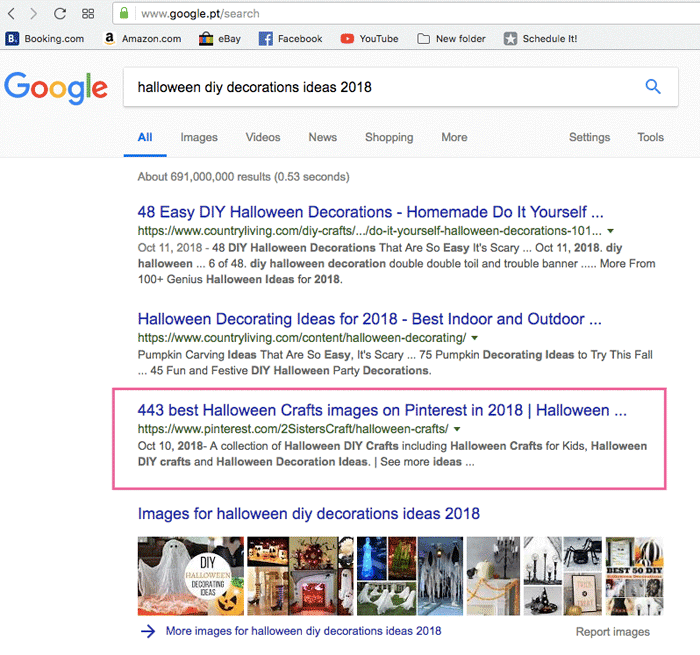 Google apparently considered these pages as super relevant for some seasonal keywords, I used to see a lot of these pages show up high in Google SERP for topics like DIY, home décor, art, image search. If you included the word “Pinterest” in the search, you’d definitely get a few explore pages in Google top-10. But then Google changed their mind – these pages were kicked out from search results and pins that were lucky to get into those Explore pages, can’t get that additional Google traffic anymore. Is there still any way your Pinterest SEO could also help with Google SEO? Yes, I’m seeing Pinterest boards and even individual pins showing high in SERP for many keywords in Google. Obviously, they appear in Google because they were originally optimized on Pinterest. This is a link to a Pinterest board. The description Google takes from the board description. Now, the owner of this board apparently can get some additional seasonal traffic from Google as well. Do Pinterest’s results show up for any kind of keywords? Of course, not. You probably noticed that my keyword was a pretty specific, long-tail query. You will find Pinterest pages for keywords with lower competition more often. Also, I believe it depends on the niche. Pinterest users are known for loving all things DIY, home decor, crafts, recipes, art, etc. These are the searches which also imply more image results, so in these cases, Google tends to show Pinterest content more often. This article is long, yet I only managed to give you the basics of what you need to know about Pinterest SEO. You can get your entire strategy for SEO on Pinterest set with my Pinterest SEO Traffic secrets course. One thing is sure: you can boost your website or blog traffic using Pinterest SEO in a smart way. The competition for free Pinterest traffic will increase over time as more people try and see SEO on Pinterest driving them traffic. Don’t leave this page without notes about the changes you need to apply to your Pinterest account. There is definitely something you could improve in your profile title or bio, in your board titles and descriptions. You could also analyze some of your main keywords in Google search results. If you see Pinterest boards or even specific pins showing up, there is a chance you could also leverage your Pinterest SEO efforts to get more space in the Google SERP. Let me know if some of the suggestions from this post improve your positions in Pinterest search for people, boards or pins. Or if you managed to get higher in Google results with your Pinterest SEO changes – let me know in the comments, share your screenshots! Did you find this post useful? Save THIS PIN to your Pinterest Marketing board on Pinterest to check it later again. Wow! This is gold. Thanks for putting this together. I actually found that I could not put that many characters in my profile title. I will take another look later on. I am starting to be more wary of the SEO practices now for each pin too. Hopefully it won’t dilute the platform as more and more marketers use it. Cracking numbers on that for your blogs traffic though. I know it can be done too. I used to get great numbers to my pets blog a few years ago from Pinterest. It’s reassuring seeing you get those numbers to a marketing blog. Thank you for your kind words, I’m glad the post is useful. Pinterest limited profile title by 30 characters this year. However, there used be a workaround. It used to be possible to edit your profile name and add a longer title using the Pinterest app. This might not be working anymore, but you could try on the app to see if it allows you saving with more than 30 characters. Doesn’t look like you Can?… in the edit profile you cannot edit the title it would seem. 2 – Only sharing on active boards and using at least a 24 hour interval between pins of the same URL. I’m glad Pinterest SEO works for you! Last time I checked about two weeks ago, the trick with changing profile text in the app for a longer one still worked fine on my Android. This a fantastic post! 🙂 It is very informative and useful. Thank you for your kind feedback, Christina!